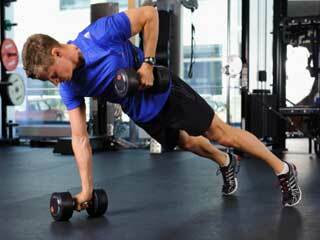 Target every core muscle even when you have only few minutes. Slowing down on the reps will help you get more benefits. Also make sure that you don’t hurry as it may injure you. Sometimes we find it hard to manage time for workout. But, we must not overlook our health in the quest to make money. There can be several quick ways to get your body toned. You will find the following exercises very useful whether you struggling a hectic schedule or chilling on a vacation. This can be a very effective exercise for your arms. You can do it anywhere you want to and whenever you feel the need. To start the exercise get on your hands and knees as if you were to perform a regular push up. Now using your abdominal muscles slowly extend your right leg parallel to the floor. Now with one leg extended, it’s time to perform your pushups. Bend your elbows to lower your torso and bring it closer to the ground and then push it back up. Perform the same with each leg extended for at least 15 times. If you find it difficult to perform you can try a slightly easier yet effective version of the exercise. You can use a chair to perform raised pushups. To perform the pushups stand on the balls of your feet with your hands holding the arms of a chair and bring your chest closer to the chair like a regular push up. Your back needs some quick attention too and you can do that with standing back kicks. To perform the standing back kicks, stand straight and place your hands on your waist. Now shift your weight on your right leg while standing completely still. Using your glutes kick back with your left leg. Move the leg back into the position and kick back again for atleast 20 times. Now shift your weight onto the left leg and kick back with the right leg for as many times as possible. To increase the effectiveness of the exercise you can perform it at a slower pace than usual and hold each kick for at least 30 seconds. To perform this quick exercise which can be very good for your abdominal muscles, lie straight on your back with arms stretched on your sides. Now slowly lift your legs and shoulders off the floor and try to make a 40-45 degree angle at your waist. Hold the position for as long you can and get back to the initial position. Rest for few at least 10 seconds and repeat the exercise 10 times. To take care of your legs, you can perform wide squats. To begin with, stand with your feet at least 3 feet apart and toes pointed outwards. Now slowly bend your knees and elbows to do squat and then straighten your legs up. Perform at least 20 reps of this exercise. Slowly place your left arm behind your head and pull your navel to your spine to engage the lower abdominal muscles. Now slowly rotate the left rib cage towards the floor. Hold the position for some time and return to the starting position. Switch to the other side and perform the same exercise.